Post Falls Naturopathic Clinic has used the NES ProVision device for over 9 years now. In fact, Dr Lachman is the second person in the United States and the Sixth worldwide to be certified as a NES Practitioner. In April we will be adding the remarkable new energetic treatment device to our NES system called miHealth. 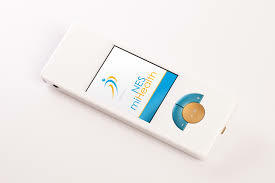 The NES miHealth is a powerful hand-held device that is non-invasive and effective for releasing energy blockages, as well as for addressing your common complaints. You can look at miHealth as it was featured on THE DOCTORS TV show. We will use miHealth in-office during your appointment to release any blockages or trigger points identified during by the NES ProVision scan (the software will recommend your specific therapy functions). miHealth my reduce inflammation (pain) as it opens up energetic pathways. You also can purchase the NES miHealth Pro device that allows you to do remote scanning and treatments without having to travel to our office. This prepares your body and its channels for receiving new information and nutritional building blocks at-home when you take your infoceuticals, NEStrition and whole food nutrients. We will be utilizing miHealth therapies for our patients before they begin their infoceutical and Nutritional protocols. This should improve the overall effectiveness of all our therapies. In essence, the NES miHealth speaks the human body’s language, producing electrical impulses that direct the body to the source location of energy blockages opening up the energetic pathways, stimulating the trigger points and bringing the body back to its natural oscillations and preparing it to receive the new Information from the NES Infoceuticals, NEStrition and our other whole food supplements. The Infoceuticals reimprint the body-field back to its original blueprint providing new, and corrected, Information which in turn help the body to ‘remember’ issues that it may have “forgotten” (i.e. information has become distorted and the origin of the physical challenge has therefore been lost). Another unique feature of the NES miHealth is that you can use each of its functions in both on-body or off-body (broadcast) mode. That way, no matter what unique constellation of symptoms or complaints you have, we can fully control the intensity of the therapy. Recently a large Outcome Study for miHealth that included 251 subjects and which collected data across 367 data points. In the study, 88% of the participants benefited from the NES miHealth therapy at the initial consultation. Bio Electric Stimulation: which provides stimulation of the skin and enhances blood circulation in the underlying tissue. Also stimulates neuropeptide release and C fibers. Global Scaling Frequencies: which are based on natural oscillations of the energy inside the human body, allowing the miHealth to correct the energy flowing inside the body or body-field. Information Medicine: These are specific and proprietary codes we’ve identified while mapping the entire human body-field, which help to release and rejuvenate the energy of the body-field and prepare it for optimal uptake of any imprinted infoceutical or NEStrition protocol. Pulsed Electromagnetic Frequencies (PEMF): uses electrical energy to direct a series of magnetic pulses through injured tissue to stimulate cellular repair, reduce inflammation, and induce the body’s self-healing response. Please CONTACT US if you would like to experience the wonderful benefits of miHealth.